Contrary to popular belief, leather is not self maintaining. While it is low maintenance, it certainly isn't NO maintenance. You don't need any leather maintenance experience to use our Leather Protection System, just a desire to maintain your leather goods. Protecting your leather from the start will shield it from contaminants creating an invisable barrier that will enhance stain resistance and cleanability. Q. Can I use this in my new car? A. Yes you can. You can use our Leather Protection System on any leather surface. These directions are for NEW leather products. 1 Spray CouchGuard® Leather Protection Spray onto leather surface and wipe over with a clean white cloth until an even coat has been applied. 2 Wait 5 to 10 mins and apply a 2nd coat in the opposite direction. 3 Allow to completely dry then apply CouchGuard® Leather Conditioning Cream to leather. Dry time approximatley 1 to 2 hours. 4 Always work on one area at a time. Use only as directed. Tip: Dirty leather such as leather on couches or in motor vehicles should be deep cleaned with CouchGuard® Leather Cleaner before appling our Leather Protection Spray. Available in our Leather Care Kits. 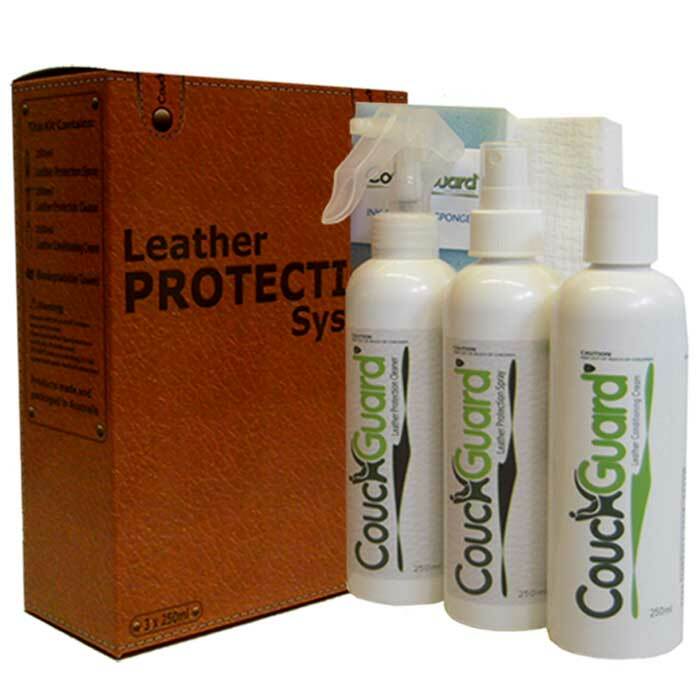 1 Spray CouchGuard® Leather Protection Cleaner onto leather surface and wipe off with a clean white cloth. Repeat if nessesary. 2 With the contaminants removed, re apply CouchGuard® Leather Protection Spray and Leather Conditioning Cream as direct above. For best results allow the leather conditioner to absorb into leather for 1-2hrs before using.